Whenever I see tropical fruits like mangosteen, rose apple (jambu) and bananas in grocery stores or wet market my mind goes to my youngest sister. They remind me of my childhood. I remember how my youngest sister ate all baby bananas we had on the table in one morning for her breakfast when she was 5 or 6 years old. I think that was about 7 or 8 bananas in a bunch. Amazingly it didn’t upset her stomach. We still laugh when we talk about it. She is a mother of two beautiful girls now. My sister and I also like to play guessing game with mangosteen. Each of us will take turn to guess the number of the seeds before we eat our mangosteen. Rose apple or jambu in Malay language had special place in my heart. We lived in one of small town in Indonesia when we were small and our neighbor had a big jambu tree. At certain period of time, the jambu leaves fell off covering the ground around the tree. I like walking or jumping on it and kicking some of those leaves to the air. I felt like leave fairy. I want to bring back those sweet memories by creating miniature fruits with clay. I am delightful being able to share my creations with you. You may wondering what does it for? Have you ever seen someone wearing cute fruits or foods earring? That’s it! You can have cute and unique jewelry with this miniature. Mangosteen is fondly known as a queen of fruits from the tropical regions. Indeed it's famous in South East Asian countries. Let's make the miniature of this fruit for earring, jewelry charm or doll house accessories. 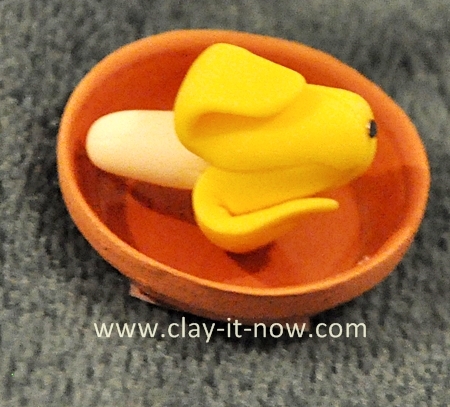 We've "clayitnow" everyday item like peeled-off banana to a cute miniature clay jewelry charm. Follow our tutorial to make the banana clay. 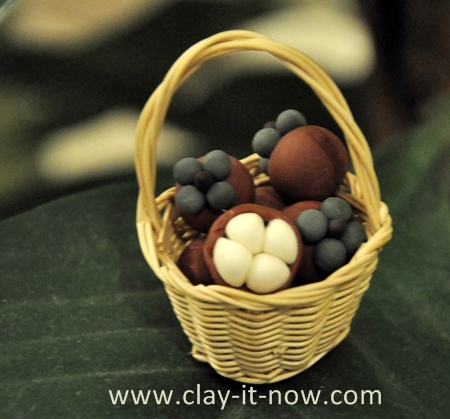 Some of you have asked me about the type of clay that is best for miniature tropical fruits. 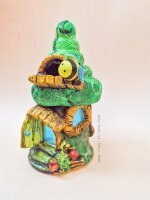 Cold porcelain clay - the traditional cold porcelain where you use corn flour, Elmer's glue and cooked it on the stove. No cook cold porcelain clay that I've called it as "best homemade clay". Main ingredient would be plain flour mixed with Elmer's glue, moisturizer and olive oil. My favorite store bought clay is Makin's air dry clay. All of the above will dry hard with smooth texture.